Cheney (not that Cheney) slams Obama for supposedly too pro-Russian in his comments on the Cold War’s end in his speech at a Moscow university. Here’s why I think she’s wrong (article on TNR.com’s The Plank). In my Weekly Standard article before Obama’s trip, I said that the most likely outcome would be “business as usual.” And, evidently, so it is. Russia will not agree to tougher sanctions against Iran over its nuclear program in exchange for a new nuclear arms cuts deal with Washington, Interfax news agency quoted a foreign ministry source as saying Tuesday. A Kremlin source told Reuters that the exchange of remarks over START and Iran did not indicate any change in the overall atmosphere of Russia-U.S. contacts. Pretty much the textbook definition of business as usual. In other, little-reported news, Medvedev reiterated right after the summit that Russia still plans to deploy (not-yet-existent) missiles in Kaliningrad if the U.S. goes ahead with the missile shield installations in Poland and the Czech Republic (plans that remain intact, though still under review for effectiveness, according to a July 10 briefing by Assistant Secretary of State for Public Affairs Philip J. Crowley; see the video here at 13:26). Of course, this renewed crude saber-rattling actually makes it harder for Obama administration to scrap those sites if the review finds them less than effective, because then Obama will be seen as giving in to Russian blackmail. Of course, it’s entirely possible that the Kremlin junta, with its “foreign policy” of tantrums and grievances, would much rather have those missile defense installations in place and be able to scream about being threatened and disrespected by the Americans. So much for the beginning of a beautiful friendship. So, we now have a bilateral presidential commision, to be coordinated by Secretary of State Hillary Clinton and Russian Foreign Minister Sergei Lavrov. Say it ain’t so! On one side, Michael McFaul, a strong opponent of Russian authoritarianism, a champion of the “color revolutions,” a passionate believer in democracy who takes pride in having been a part of Russia’s democracy movement in the 1980s and ’90s. On the other side, Vladislav Surkov, the Kremlin’s Putin-era ideological enforcer, creator of the term “sovereign democracy” (which seems to be shorthand for “we’ll define democracy as we damn well please, and everyone else should keep their nose out of our business”) and of Nashi, the thuggish “youth movement” launched with the express purpose of thwarting grass-roots democratic activism of the kind that brought about Ukraine’s “Orange Revolution”). The same Surkov who just recently rejected the idea that the crisis should be an incentive for the Kremlin to loosen its iron grip on political life within Russia. Putting Surkov at the head of a commission on the civil society is a bit like putting Bernie Madoff at the head of a commission on business ethics. Or Britney Spears at the head of a commission on marriage and the family. At Obama’s meeting with the Russian opposition today, according to Grani.ru (in Russian), Sergei Mitrokhin of the semi-loyalist Yabloko opined that “Russian-American relations must be developed in such a way as to involve the Russian political and military elite into common projects, which will contribute to the development of democracy in our country.” If that’s the idea here, the notion of McFaul trying to teach Surkov democracy is darkly hilarious. Later, at the Russian-American NGO forum where Obama appeared for about half an hour, Russian participants including veteran human rights activists Ludmilla Alexeyeva, Lev Ponomarev, and Sergei Kovalev asked Obama to replace Surkov. That, of course, would be quite a slap in the face to the Russians; it will be interesting to see how this impasse will be managed. One has to wonder what McFaul, also present at the forum, was thinking — he must have seen the makeup of the commission ahead of time. Kommersant‘s Sidorov believes that the Surkov appointment signifies “the triumph of ‘realism’ and, simultaneously, the rejection of the principle of support for democratic transformation and civil society in other countries.” I hope he’s wrong. Nonetheless, it is a rather alarming choice, seriously at odds with Obama’s pro-democracy statements in his Moscow speech. First, there was the Cairo speech to the Muslim world. Now, Obama speaks to Russians at the graduation ceremony of the New Economic School. It was a very, very good speech that hit almost all the right notes. The right amount of flattery for Russia as a “great power” and for its cultural and scientific achievements (and I’m glad that, in mentioning the great 19th Century Russian poet Alexander Pushkin, Obama resisted the temptation to claim kinship with Pushkin due to the latter’s African ancestry, as a few Russian commentators semi-facetiously predicted he might). Recognition of Russia’s enormous sacrifice in World War II, a very big topic in Russia these days (though with a major missed opportunity to remind the audience that Russians repelled a foreign tyrant and butcher only to be re-victimized by a domestic one). Also on the plus side: there were no apologies, no genuflection toward the official Russian point of view on NATO expansion or the missile shield. 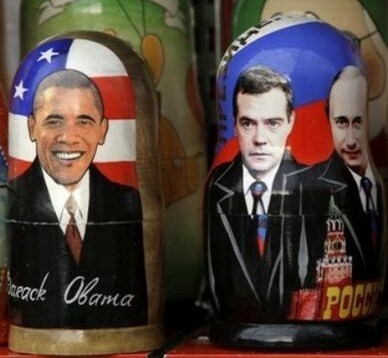 On the contrary, Obama once against emphasized that neither is a threat to Russia. So around the world, America supports these values because they are moral, but also because they work. The arc of history shows that governments which serve their own people survive and thrive; governments which serve only their own power do not. Governments that represent the will of their people are far less likely to descend into failed states, to terrorize their citizens, or to wage war on others. Governments that promote the rule of law, subject their actions to oversight, and allow for independent institutions are more dependable trading partners. And in our own history, democracies have been America’s most enduring allies, including those we once waged war with in Europe and Asia — nations that today live with great security and prosperity. Moreover, in discussing Russia’s “rightful place” as a great power, Obama also delivered a devastating indictment of the Putin regime’s vision of the world — the vision that has been force-fed to the Russian public for the past decade by Kremlin ideologues. So, there’s an agreement on nuclear weapons cuts. Is that such a step of major importance today, when the once-terrifying prospect of all-out nuclear war between the Soviet Union and the United States is of far less concern in the public mind (and rightly so, I think) than a stray North Korean or Iranian missile? Since the fall of Communism, disarmament has become a ritualistic ballet that mainly flatters the Russian ego because it makes Russia feel like a fellow superpower. (The cuts benefit Russia in other ways as well; its nuclear arsenal is badly in need of an upgrade, and the country can ill afford a new arms race.) Has Obama agreed to link stratetgic arms reductions to the issue of missile shield installations in Eastern Europe? Obama says no (and his chief Russia advisor, Michael McFaul, says no even more emphatically); Medvedev seems to think he has, because discussions of “defensive weapons” are to be included in the talks. There’s also a statement about “cooperation” on missile defense. Whether any of this is meaningful remains to be seen. Russian policy expert Dmitry Trenin of the Carnegie Moscow Center writes that the way out of the impasse is for the U.S. to agree to a joint missile defense with Russia, a decicion from which Trenin says “the U.S. has little to lose” even if it ultimately doesn’t work out. The problem is that, as Trenin admits, Moscow does not want a joint ABM defense system if the U.S. also proceeds with missile shield installations in Eastern Europe. Dead end. There is a deal to allow the transit of U.S. weapons and military personnel across Russian territory (and airspace) to Afghanistan to help the U.S. and NATO military effort there. As Russian military analyst Alexander Golts notes (Russian-language link), “While Moscow presented this as a concession, in reality it is obvious that the Americans’ war effort in Afghanistan ensures Russia’s security.” Golts believes that this deal was the only useful part of the Obama-Medvedev talks, otherwise no more meaningful than (in his colorful metaphor) the chatter of extras on a movie set who must maintain the background noise of conversation.